The hotel offers a restaurant. A bar/lounge is on site where guests can unwind with a drink. Guests can enjoy a complimentary breakfast each morning. A computer station is located on site and wireless Internet access is complimentary. This business-friendly hotel also offers multilingual staff and an elevator (lift). Onsite self parking is complimentary. Airport Hotel Aurora Star is a smoke-free property. 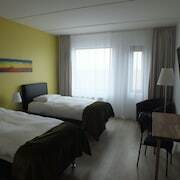 Situated near the airport, this hotel is 2.5 mi (4.1 km) from Duus Hus Cultural Centre and 2.6 mi (4.2 km) from Reykjanes Art Museum. The Icelandic Museum of Rock 'n' Roll and Viking World Museum are also within 6 mi (10 km). A restaurant, a bar/lounge, and a 24-hour front desk are available at this smoke-free hotel. Free continental breakfast, free WiFi in public areas, and free self parking are also provided. Additionally, a computer station and multilingual staff are onsite. All 72 rooms provide free WiFi, room service, and satellite TV. Showers, phones, and desks are among the other amenities that guests will find. 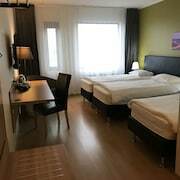 Airport Hotel Aurora Star offers 72 accommodations. Televisions come with satellite channels. Bathrooms include showers. 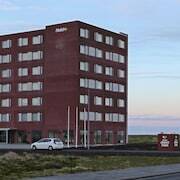 This Keflavik hotel provides complimentary wireless Internet access. Business-friendly amenities include desks and phones. Housekeeping is provided daily. A complimentary continental breakfast is served each morning between 5 AM and 10 AM. Aura - This restaurant specializes in international cuisine and serves dinner only. A children's menu is available. Open daily.